Home > Pre-schools > What Happens at Pre-school? One of the key questions of parents who are choosing a pre-school for their child is what actually happens during the day. Although the exact details will vary from school to school, here’s some insight into how the day is typically structured in pre-schools. It’s no surprise that parents are keen to know what will happen when their child goes to pre-school. As well as informing them, it’s useful when preparing children to be able to explain what activities and learning tasks they may be involved with during the day. It’s a big move going to pre-school for the first time, but the more informed parents and children are, the easier it may be to adjust to the new experience. When children arrive for the day, the pre-school class comes together for registration. The children’s names are read out and their attendance is noted – in a similar way to ‘big’ school. Playing in the Wendy house. Playing with sand and water. Make believe play with other children. Some play on the computer. 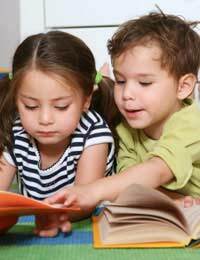 It’s recognised that children love stories, so at some point during the session there’s likely to be a story time. This may also be accompanied by songs, where the children can join in. Physical play is important too and there will be some type of physical play incorporated into the pre-school learning experience. It will be designed to improve the key skills of children, both physically and socially, for example a child’s balance, co-ordination, playing with others and the ability to learn to take turns with other children. Children will need a PE kit for physical play, which the pre-school will advise on. Physical play may take place indoors or outdoors and may involve the use of equipment such as a climbing frame, trampoline, tunnel or slide. At some point during the activities there will be a snack time, where children can have a break and enjoy a healthy snack, such as fruit. There are also other activities which may take place occasionally on a weekly or monthly basis, or at the discretion of the individual pre-school. For example, some may run ‘bring and tell’ sessions, where children take in items to tell the others about, or share information about what they did over the weekend. There may also be occasional sessions such as learning to cook simple foods or snacks. Seeing this on paper often makes parents amazed at just how much pre-schools do manage to fit into the time when children attend, but as they have short-attention spans, the activities are broken down into manageable chunks of time. With such variety on offer, you can be sure that your children are learning all kinds of new skills and abilities and are building up their knowledge step by step. The pre-school environment also offers a good opportunity for children to interact with their peers and make friends, plus it’s a good grounding for going on to ‘real’ school when they’re older.